There are lots of agency listing websites and directories – I have long been a fan of Chuck Meyst at AgencyFinder.com and Tom Holmes’ Creative Brief in the UK. DesignRush is a nicely designed website for listing agencies allowing filtering by country and skillset. I found three New Zealand agencies there – none of them competitors for us. But instead of reaching out for our profile and submitting it, I decided not to go that route. The main reason is that the site lists agencies with a price per hour as part of the filtering. This is WRONG on many levels. Firstly, buying creativity is not like buying socks – a commodity. So thanks, but no thanks for us. A client approaches and asks your price to solve a problem situation. You know the answer and how to solve it. Does it matter if you solve the problem in five minutes of 50 hours? Will the client be happy that the problem was solved or unhappy that you did it in 5 minutes? You are asked to respond to a brief in some detail. You do it with a written proposal which the prospect takes and uses as a bid document to ask other firms to submit prices. You don’t get hired as a result. A marketing director asks for your credentials and whether you have experience in a particular industry. Does this matter to her – is it an exclusion or inclusion filter? Does it affect your ability to do the work? Coaching and learning how to navigate the new business development minefield is available. I was doing some training with a client this week and they asked me about pitching for new business. There are three books on my shelf which I have found useful in my 25 year career. David Kean was interviewed and I found this 50 minute audio interview useful. A question from Quora was sent to me to answer. And it demonstrates so neatly why many new business people get discouraged by apparent failures. My answer shows how to play the “advantage” card from a disappointment and position yourself for future success while gaining valuable business experience from the situation. My business partner’s dad/investors asked for a pitch, to which he said no after a while, but still plans to use some of the ideas. What can I do? I told her this idea I had for a concept store that she just shared with her Dad who offered to invest/add it to his Group. After talking a few weeks ago, he just sent us a decline letter, but she says he & his partners may still use some of my ideas. I’m lost… and she doesn’t care.. What can I do ? Write back to each person, individually, thanking them very much for their time in hearing your pitch. Be sure that they understand how much of the pitch was your concept/idea. Say you’re sorry that they have decided not to progress working with you at this time. Tell them that this is only one of many bright ideas you have to contribute to their businesses and ask for an introduction to two other people who might be keen to work with someone of your talents. Four days later, follow up with a phone call to each one to check they got your email and to ask for the introductions. The outcome will be that you will probably not get any money from a) or b). But the introductions you receive will give you entry into a new circle of prospective employers and clients. The psychology of getting them to acknowledge your contribution (which they may use in future without paying) provokes the principle of reciprocity. You gave them something of value and now you are asking for something of value in return (introductions). The follow-up shows that you are more determined than most (e.g. your business partner) and therefore are “one to watch” for the future who may benefit them again. Lastly, in future don’t share your ideas with your business partner again without first gaining agreement about how they are to be used and valued. can use to open new leads. A typical pack has 4 videos – they come with volume controls and the larger packs have more videos on them. Al the components are built in – from batteries, speakers to CPU. They are encoded to Xvid format – the reason to use a specific codec is that it is lower file size with max picture quality. A standard has 256 mg memory of which 170 is usable the rest is operating system. so it gives about 17 minutes of video playback. Finish watching, close it like a book and that switches it off. In the spine there’s a little USB port you can charge the battery and uploading the videos. If a client wants to use it the production process is firstly to design the outer pack – card wrap – using a standard Adobe Illustrator template. The videos have to be produced and then you have all the assets. These are sent digitally to China. The factory sends back a prototype in digital print (not litho). Sometimes there are small amends, it is signed off for manufacture and production. One thing is critical is quality assurance with Chinese factories -we include two rounds of this – locally it’s checked in Shenzen and then it’s sent out and we check a few samples too. Then we dispatch – sometimes it’s a bulk delivery, other times we do the fulfilment individually. As part of the marketing it’s important that the telesales follow up to fix the meetings. What types of Business use PitchPack? It’s any B2B organisation providing a higher value product or service. Tech companies like it, hotels, consultancies, engineering groups and some internal comms – high level changes across global senior teams. Integration wit the sales funnel – the clients using account based marketing principles. Some use it for the ‘door opener’ – grab attention of a senior decision maker. It’s critical to have a structured follow up process. Or use it as a leave-behind or a send-after to answer questions. Salesman can film themselves on a mobile phone giving the answers and then include other videos too. Those companies that are a bit more sophisticated and using lead scoring, for example, the score triggers sending a pack. Personalisation – we are used to it with paper mail, but when you show the recipient that there’s an introduction just addressed to them – it’s flattering. Anecdotally we hear it is very powerful. Results – using a campaign with a global software company – we did a small run of 250 packs of which 240 were distributed. They got 23 meetings with decision makers and they’ve got 4 deals with an average value of GBP250k each. That campaign cost 5k on the packs themselves, 7k producing one video and re-used another couple of videos. Total campaign cost 16k. Why should our readers try the service? Video is growing – mobile traffic about 50-70% of mobile traffic is video now. Cisco predicts that 1/5 of the world’s population will access video online by 2016. As a medium, video creates feelings of trust and so when brands use real people or show people doing real things curiosity is triggered. When making video for marketing purposes don’t put everything in. Leave them wanting more. Confidence in the brand is built and sometimes amusement. If you can make video for business funny you will have next to no competition because there’s so little out there. With that popularity it’s a blessing and a curse – the competition will only get more furious. Marshall Mcluan said the medium is the message in 60s and these packs are both – it allows people to explore video in their own time in their own way wherever they happen to be. This is an easy differentiation tool – stand out from the crowd. I remember in 2005 there were personalised USB sticks but now these are ubiquitous. This type of marketing tactic is now at its 2005 moment but in 3-5 years it’ll be old hat. If you are producing video for the pack, the content can be re-used across other media – home page, landing pages, powerpoint, email-able files. The results are pretty tangible – looking at it in pure numbers. 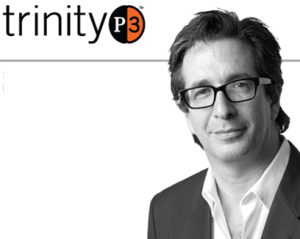 This week we’re taking a look at Trinity P3, a firm that focuses specifically on aiding marketers and agencies find work. Trinity P3 work very closely with their clients. Instead of working through lists that agencies and brands can search, they specifically communicate to the right people to match agencies and brands together. Throughout this process they help their clients manage themselves and their connections. With Trinity P3, agencies get matched with brands and can have their company processes assessed and improved. In addition to budgeting, benchmarking and company stats tracking, Trinity P3 also offers agencies an assessment on their environmental impact as a company. With agency search and selection services (including agency assessments) and resource acquisition and allocation, Trinity P3 are an all inclusive package company for finding the right agency for a given brand. They also offer budgeting services for brands on their work. Like agencies, brands can also have their work processes reviewed and revamped by Trinity P3. They also receive the same offerings for their environmental impact that Trinity P3 offers agencies. Trinity P3 charges clients (both agencies and brands) on a case by case basis and every service they offer on their website comes with a description accompanied by a link to submit a request for a proposal. Who is Trinity P3 right for? Trinity P3 works closely with their clients by maintaining communications rather than using menus and forms. This means they establish a close connection with you as a client and help you with more than just project management and project acquisition or deployment. Trinity P3 offers a good range of services for connecting companies to the marketing industry, suggesting they are appropriate for clients just starting out. Few contact free services – The only way to interact with Trinity P3 and their services is through direct messaging of general contact or for proposals. Difficult to compare agencies as a brand who is searching – They do not have a detailed list of firms and contacts available to you for your assessment outside of directly messaging them. This makes search and selection difficult although still possible as they have links to their contacts so you can assess them individually. Xero is a hugely popular cloud accounts package that has taken much of the Intuit QuickBooks and MYOB business from SMEs worldwide. Prompted by an article in Forbes about in-house marketing teams versus external agency use, I remembered a pitch we sent off to Xero. As a customer of Xero and as a marketer, the things I think are lacking or could be enhanced primarily relate to the ease of re-using content and proactively driving it out to the right audience. 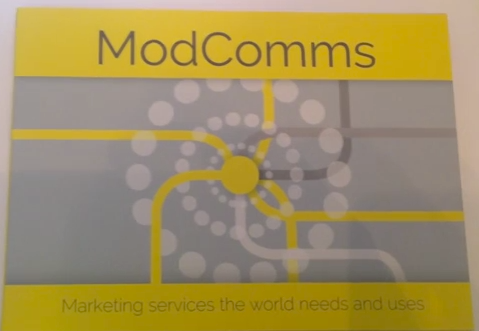 B2B comms for existing customers, in a nutshell. Since Xero is growing internationally, they increasingly have separate user groups who should be communicated to differently – because they need different things from Xero. Marketing suggestions – I have lots more…. After signing up, there’s nothing to drive me deeper into using the higher features of your products, unless I search. How could Xero be leveraging existing customers to drive improved new business and new trial accounts using member-get-member referrals and other incentives? Autoresponders – for new users within the trial period and for first few months of use – Xero could have a ‘guide’ much like Kiwibank‘s “Becky” who is there for the user, who acts as a signpost to helpful information inside your knowledge base, who helps check they’ve got the system set up properly. Why are you using FeedBurner to distribute your RSS feed from the blog? It’s unsupported and you could be leveraging the channel for marketing messages to your active users in order to drive deeper brand engagement and possibly sales (see 2,3,4 above). The more you blog, the bigger your archive. Readers rarely dive very deep and yet there’s probably heaps of helpful content which is being ignored. Could they be created into “tip sheets”, e-books, training manuals and other support material? These content solutions can be supporting 1, 2 and 4 above. As Forbes says, it’s great to be an in-house agency – but lifting your head above the parapet and seeking input and inspiration from an external agency team can be very beneficial.